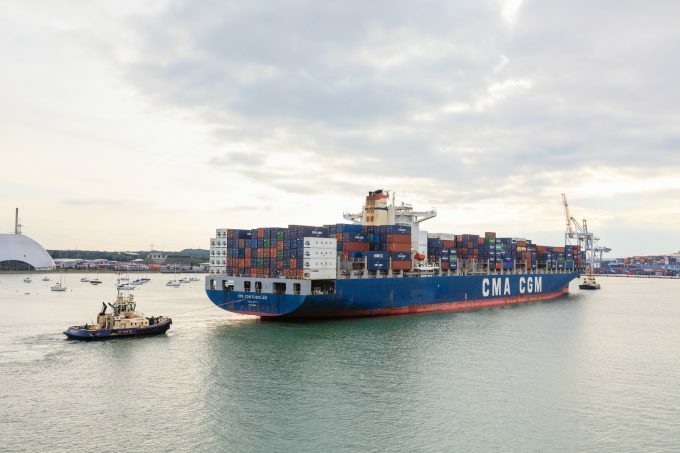 CMA CGM has shocked the market by reducing Asia-North Europe FAK rates at a time when most carriers are trying to drive them up. The French carrier published new FAK rates today of $1,000 for a 20ft container and $1,800 for a 40ft. Valid from 24 September – “until further notice but not beyond 14 October”– they are down from $1,100 and $2,000, respectively. For a 40ft high-cube and 40ft reefer, rates are reduced from $2,050 to $1,850. Meanwhile, container spot rates from Asia to North Europe as recorded by Drewry’s World Container Index (WCI), were down 5% this week at $1,713 per 40ft, while for Mediterranean ports there was a significant dip of 12% to $1,665 per 40ft. With the outlook for demand after the peak season period looking increasingly bleak, carriers have announced a list of blanked sailings around the early October Chinese Golden Week holiday period. For example, Ocean Network Express (ONE), a member of THE Alliance, has advised that its FE2 and FE3 loops, scheduled to sail from Asia on 1 and 5 October will both be cancelled. However, in addition to its blanking programme, the 2M alliance has taken the strategy to the next level by removing an entire loop. Maersk Line and MSC have decided to “temporarily suspend” their AE2/Swan service, with a view to restoring the loop “provided that market demand recovers”. It is a radical step by the 2M partners that will see over 200,000 teu of capacity removed from the tradelane. That is 11 ultra-large container vessels averaging 19,000 teu, eight operated by MSC and three by Maersk, that will need to find new employment, but will most likely be idled for the duration of the service suspension. Industry consultant Neil Dekker told The Loadstar today: “As usual, Maersk and 2M have been the first to react on the Asia-North Europe trade. This is a bold move, but it emphasises how lines now are really looking at where and how revenue can be made and, more to the point, maintained. He noted that the suspension of the loop would remove around 6-7% of weekly capacity, and suggested that Maersk and MSC would use the vessel downtime for maintenance and repair activity, with some work being done to be ready for the IMO 2020 0.5% sulphur cap regulations, which in the case of MSC could include the installation of scrubbers. Meanwhile, the transpacific trade continues to go from strength to strength, as the peak season is intensified by a frantic rush to get containers loaded to the US before the 25% duty hikes likely to be levied on a range of consumer goods. Carriers are putting on extra loaders to cater for the cargo rush and, with very strong demand, container spot rates have soared. According to the WCI, at $2,362 per 40ft this week, rates from Asia to the US west coast are 58% higher than a year ago, while for the US east coast, rates are 57% higher at $3,064 per 40ft.